“A Hundred Fires in Cuba” is an excellent read. Actually, let me just put this out there right from the start: “A Hundred Fires in Cuba” by John Thorndike is one of the best books I have ever reviewed for Reader Views and is well deserving of the five stars I am giving it. The story is mostly set in late 1950s Cuba and told from the perspective of the main character Clare, a photojournalist who finds herself in a love triangle between a Cuban business man and the father of her child, Camilo Cienfuegos, who also happens to be one of Castro’s head commanders. While both Clare and Camilo are well written and interesting characters, so are many of the other supporting characters. In fact, almost everyone is interesting. The plot sounds simple enough, but it is so well done that at no point do you even consider that this story has been told a thousand times before. Thorndike creates such believable and interesting characters and settings that the plot moves along smoothly without issue or feeling repetitive. In fact, I made it all the way through the first five chapters before I started to think this might actually be a romance. To be fair romance is a big part of the story but it is the less interesting part and really just works as a tool to move this character around this well-written world. It is hard to explain just how well this book is written. Thorndike transports the reader into newly liberated Cuba right at the coming of power of Fidel Castro. He uses this historical backdrop to really bring the characters to life. The small details in both the characters and setting make every moment believable. Historically the book seems genuine and accurate. As well, the dialogue fits the time and unlike so many historical fictions, it never seems like Thorndike is overworking to remind you when and where these characters live. In conclusion, I guess what I am trying to say is this is an excellent read which you should really take the time to check out. It is clearly written by a mature author who knows what he is doing and isn’t concerned with impressing the reader with the cheap tricks that often fill books of this type. Everything here is well done: the character, the setting, the dialogue, the story, and pacing all work well together. 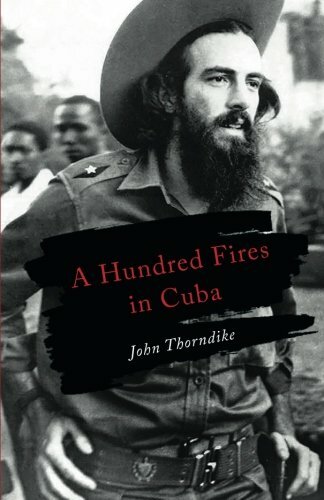 To restate what I said at the beginning, “A Hundred Fires in Cuba” by John Thorndike is a five-star read, and one of the best books I have reviewed in a long time.